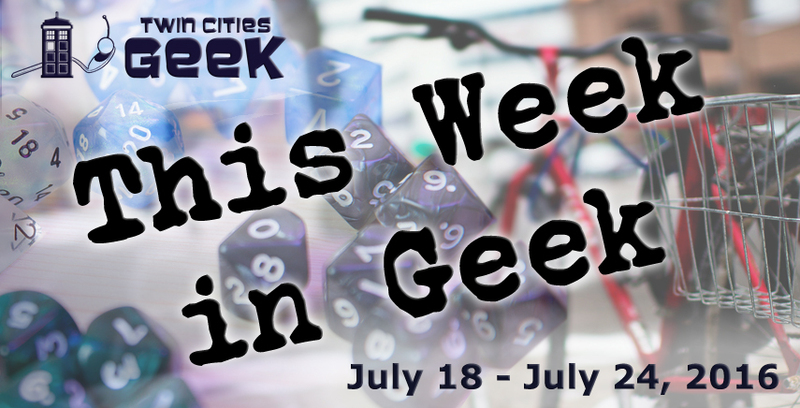 Welcome to This Week in Geek, your guide to events of interest to the Minnesota geek community for the week of Monday, July 18th through Sunday, July 24th. When: Monday, July 18th at 6:30 p.m.
Movies in the Park: O Brother, Where Art Thou? When: Monday, July 18th at 8:30 p.m. The MSP Film Society is hosting two free outdoor screenings this week, and the first of this Coen brothers classic at dusk in Minneapolis’s Gold Medal Park. Note that no chairs will be allowed to make sure everyone can see the screen, and city ordinance does not allow alcohol at the event. Click here for more information about Movies in the Park showings. When: Tuesday, July 19th at 5:00 p.m. When: Tuesday, July 19th at 6:00 p.m. The Twin Cities Roleplaying Association (an organization “dedicated to encouraging the playing of roleplaying games in the Twin Cities metro area”) invites you to “learn about new games, chat about RPGs and the industry, announce games, find players and GMs, and make new friends” at its Monthly GM and Player Meetup on Tuesday night. The location of this event is shown only to members of the Twin Cities Roleplaying Association’s Meetup Group, so join and RSVP for more information. When: Tuesday, July 19th at 6:15 p.m.
Books & Bars is an “open public book club show” hosted and moderated by Minnesota Public Radio senior producer Jeff Kamin that provides attendees with “a unique atmosphere for a lively discussion of interesting authors, fun people, good food and social lubrication.” The book being read and discussed this month is My Brilliant Friend by Elena Ferrante. When: Tuesday, July 19th at 7:00 p.m. The Geek Partnership Society’s Photography Club meets at the Waterbury Center at 7:00 p.m. on the third Tuesday of each month to discuss topics related to photography and/or participate in photo shoots. The suggested topic for this month’s meeting is “Camera Maintenance” with presenter Rusty Curry. When: Wednesday, July 20th at 5:00 p.m.
Pundamonium: The Twin Cities Pun Slam! When: Wednesday, July 20th at 8:00 p.m. The MSP Film Society’s second free outdoor movie this week is Martin Scorcese’s rock documentary The Last Waltz, screening at Silverwood Park in St. Anthony. Brian Laidlaw and the Family Trade will play a concert before the film, starting at 6:30. Click here for more information about Movies in the Park showings. When: Thursday, July 21st at 5:00 p.m. The “nerdy fiber artists” of Geek Chic invite you to join them at StevenBe “for snacks, knitting (and crocheting! ), and a screening of one of our favorite shows or movies” The cost of attending this event is $5.00, or free for StevenBe members. When: Thursday, July 21st at 6:00 p.m. Co-Op Talk is a monthly afternoon of drinks and discussion about a topic related to the gaming industry hosted by U of M–based nonprofit Glitch, which “promotes the exploration of video games as a culture, career, and creative practice.” This month, Glitch invites you to join them for the discussion “Open World Games: Does Size Really Matter?” with facilitator Felix Foster. Let’s Meet Up and Draw Jam Comics! When: Thursday, July 21st at 6:30 p.m.
Cartoonists Conspiracy Twin Cities meets at Cahoots Coffee Bar in St. Paul on the third Thursday of every month to “draw collaborative jam comics, socialize, and drink caffeinated beverages.” Anyone interested in drawing and/or jamming with them is invited! When: Thursday, July 21st at 7:00 p.m. The Girls-Only Comic Club hosts a Weekly Comics Chat on Thursday nights at the Kitty Cat Klub, where there will be “Coffee! Comics! Waffles! Talking!” Additional information about this event is posted on the Girls Only Comics Club’s Facebook group; individuals interested in attending are encouraged to join. When: Saturday, July 23rd at 10:00 a.m. When: Saturday, July 23rd at 10:00 a.m.–4:00 p.m.
Come to Frankie’s Chicago Style in New Hope on Saturday for this “Comics, Collectibles, and Cosplay Convention!! !” Admission is free, and there will be comic artists, toy vendors, prizes, a cosplay contest, and more. When: Saturday, July 23rd at 7:00 p.m. The Minnesota Center for Book Arts invites you to “Go retro at MCBA’s Unabashedly Bookish Bash, a benefit with a backyard barbeque twist!” This fundraising event will feature live music from Dan Newton and the Café Accordion Trio, art on display and for sale, food from Pimento Jamaican Kitchen, craft beer and cocktails, and an ice-cream bar. Sean was placed in a local comic shop at age eight and sent hurtling in the direction of comic-book collecting and culture just as the comics industry exploded. Now, disguised as a mild-mannered library media specialist for a great metropolitan school district, he fights a never-ending battle for the Twin Cities Geek way. Don’t forget FrankieCon II at Hot Comics / Frankie’s Pizza in New Hope Saturday 10 am! Thanks for letting us know we missed this! We’ve added it to the list.